Labor and Yesh Atid accuse Livni of misleading the public over what happened during meeting between the leaders of the three parties. The bickering among the leaders of Israel's center-left parties continues. The Labor and Yesh Atid parties attacked Hatnua chairwoman Tzipi Livni on Monday evening, saying she misled the public over what happened during a Sunday night meeting between the leaders of the three parties. Labor leader Shelly Yechimovich and Yesh Atid chairman Yair Lapid also accused Livni of creating a political spin when she suggested during a Friday evening television interview that the three parties from an obstructive bloc to the Likud. "Contrary to the agreements reached before and after the meeting last night, Tzipi Livni chose to present a false version of what happened at the meeting," the two parties said in a joint statement. "We met out of mutual respect for each other, although we have many ideological differences." "We were amazed to find that we were nothing but the decorations of a calculated spin that had no sense of truth," Labor and Yesh Atid said. "It is now clear that the invitation for the meeting was nothing but a desperate act by Livni, in light of her deteriorating situation in the polls, at the expense of voters who are longing for change." The statement further noted that "this is the same Tzipi Livni who prevented the establishment of a central bloc before the submission of the Knesset lists and now continues to deceive, divide and damage the efforts to create a viable alternative to an extreme government. 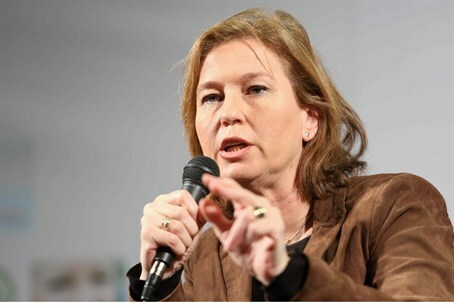 This is the same Tzipi Livni who has never guaranteed that she will remain in the political system the day after the election." "Labor and Yesh Atid will continue, each in its own way, the efforts to create such an alternative," the two parties said. Livni's party responded to the allegations by releasing its own statement which said, "The violent and unnecessary response by Shelly Yechimovich and Yair Lapid, unfortunately, proves that they coordinated their positions before the meeting, during the meeting, and after the meeting to prevent the inconvenient truth from coming out - that they are playing an individual self-serving game rather than agreeing to form a bloc that can provide hope to the public." Lapid said at an event Monday that his party would not necessarily participate in the “automatic block” coalition that Livni was trying to organize. Speaking at an election discussion Lapid said that he accepted the polls that said Binyamin Netanyahu would be forming the next government – and that instead of futilely trying to prevent that, it would be better to enter the government as a “middle balance” against the right-wing parties Netanyahu was likely to recruit for his government. Last week Lapid announced that his party would not "sit as a fifth wheel in a government of Shas and the extreme right" but added he would be willing to join a "moderate, centrist government." Yechimovich has made a similar statement, saying that she would only join a government with Netanyahu if she stood at its helm, as prime minister.